Enjoy reading your book at night in your bed, with an extra cushion under your head. Nice and comfortable and it gives a luxurious feeling, having beautiful cushions in your bedroom. Indulge yourself with beautiful pillows in your bedroom. It's like sleeping in a luxury hotel room every day. In the evening, put an extra pillow under your head to read that exciting book. Or enjoy lazy talking on Sunday morning with some extra support in your neck. The cushions are wonderfully soft and feel comfortable. It might be difficult to get up in the morning. We have a lot of cushion covers from the Finnish design brand Marimekko for you. These are cheerful and colourful, as you would expect from Marimekko. If you prefer a plain pillow, then the Ferm Living pillows are a tip for you. The Quilt cushions have beautiful Scandinavian colours, such as ochre, blue and old pink. 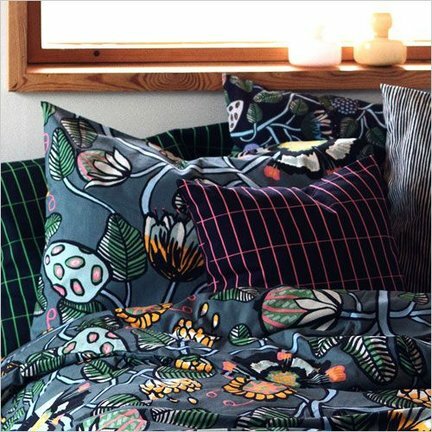 Marimekko Puutarhurin Parhaat kiss. Size 50x50 cm. Made of a beautiful quality cotton. Marimekko kisses Pieni Siirtolapuutarha. Size 50x50 cm. Colors: black and green. Marimekko Pillow case Pirput Parput lime ocre. Marimekko Pillow case Pirput Parput.